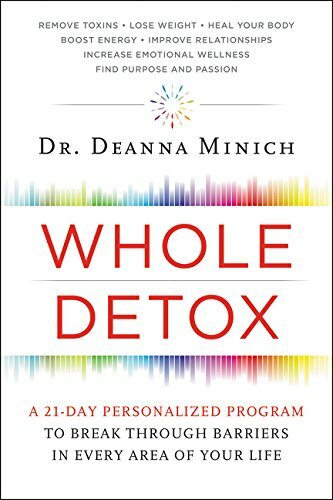 Combining her experience as scientist, researcher, and clinician, internationally recognized health expert Deanna Minich offers a comprehensive, integrative, and personalized approach to detox that helps you heal your unique physical challenges and overcome the life obstacles holding you back from total health and wellness. Most detox programsÃ¢ÂÂfrom fasts, cleanses and supplements, to elimination diets, organic diets, and saunasÃ¢ÂÂfocus on ridding our bodies of the bad foods or chemicals that prevent us from achieving total health. While some people respond well, others find the benefits are short lived and do not result in transformational change. Experienced researcher and practitioner Dr. Deanna Minich discovered that to achieve true health and wellness, we must address all of the toxic elements in our lives. Going beyond previous programs, Whole Detox offers a proven plan to uncover all the obstacles that prevent you from feeling your best. Using Dr. MinichÃ¢ÂÂs integrative, color-coded system that has successfully helped thousands, Whole Detox teaches you how to identify which of your seven Ã¢ÂÂhealth systemsÃ¢ÂÂ are out of balance, and provides a personalized prescription for diet, activity, and lifestyle changes that will make you feel better. Following her systematic, step-by-step twenty-one-day journey through all seven systems, filled with helpful questionnaires and charts, you can remove toxins, lose weight, repair existing health issues, boost energy, improve relationships, and find purpose and passion. Dr. Deanna MinichÃ¢ÂÂs methods have resulted in jaw-dropping results. By ridding yourself of all types of toxins, your body will change dramatically . . . and so will your life.